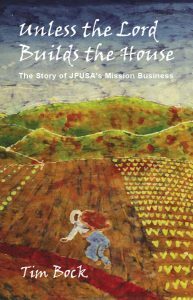 Unless the Lord Builds the House is one man’s story of a life in Mission-Business at the intentional community Jesus People USA Covenant Church in Chicago, IL. Beginning in 1978, Tim Bock relates his journey of joy and sadness, failure and success, bringing the light of Christ into the business community, and sharing the proceeds with the least of these in their neighborhood. JPUSA has run over 30 businesses in over 40 years of being together. Lessons learned in what works, what doesn’t and why will hopefully inspire you in your work to truly trust the statement; “Unless the Lord Builds the House”, we could be working in vain. Tim Bock is GM of Lakefront Roofing & Siding Supply, a mission business manager and on the pastoral board of Jesus People USA, a Christian community that lives together in a 10 story apartment building in Uptown Chicago. This community operates a homeless shelter that serves over 300 people each night. He is crazy in love with his wife Aracely and is father of the best four kids in the world.